Rebels ran half marathon & entered teams in 4 person relay. 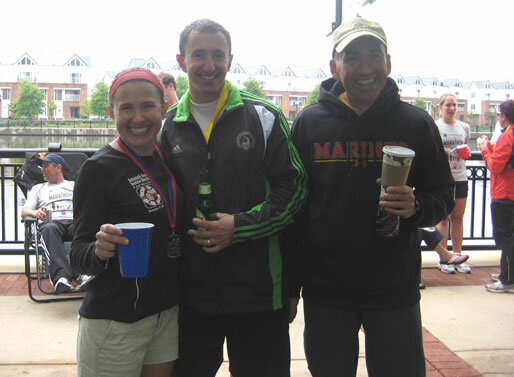 Logo gives the following recap of another fun Delaware Festival of Races event at the Wilmington Riverfront. 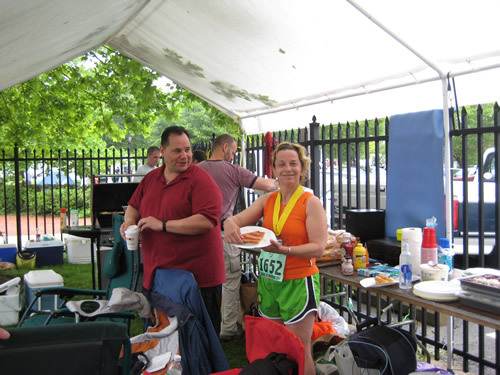 It was a warm, humid day, but Rich organized another great post-race tailgate party. The day started with Rich, the Horowitz's, and Darlise, among others arriving bright and early- 4:30AM!! to set up the now infamous Rebel Tailgate Party. Many of the Rebels were doing a race of some sort. among them: Jack, Kelly, Kristen, Darlise, Traci, Josh, Lenora, Rachel, Jim Bray, Johnny Coco&Christa, Dirk, Don, and Nina participated in the Relay portion of the Festival. Adam, Smarty, Jim Steele, Wes, Sammy, Alex(using Sharon's daughter's bib), Heather, Lori, Gelsomina, Hilary(using Sharon's bib) and Nikki all participated in the 1/2 marathon. Many Rebels were volunteering in different parts of the course and event: Nessie and Maggie and their "British Ladies" were helping out in the finishers tent feeding the well-deserved runners- Helloooooo, Paula, Dan and Andrea were welcome sights on the course as we were running (I believe only the 1/2 marathoners saw them since the relay turned around before reaching any of them on the course). OMG it was too funny!! I caught Sammy on the last uphill on King St. While we were running on the downhill he said "Lori, we're going to finish together!" I said, "OK!" As we turned the corner where the marathoners go right and finishers go left, I got tangled up with this one lady marathoner shuffling along. After I got around her I saw Sammy ahead with his hand stretched back for me. As I took it, he WHIPPED me around that final corner- I thought I was gonna go flying into the crowds!! Then he was running so fast to the line pulling me along... the crowds were cheering and screaming! It was hysterical!!! 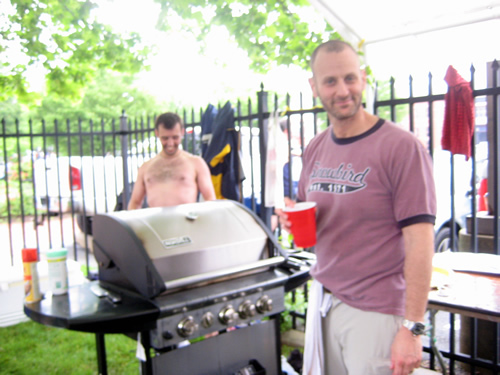 But the most important part of the Tailgate was manned by Jordan and Rich: The GRILL!!! Much food was eaten and the beers were flowing until well after 3pm!!! A GREAT time was had by all!! What a GREAT day all around! Another GREAT Rebel Event!! 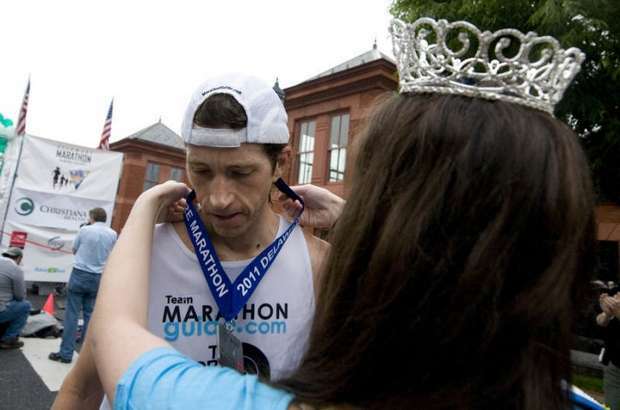 WILMINGTON -- Another year, another Delaware marathon record for Michael Wardian. 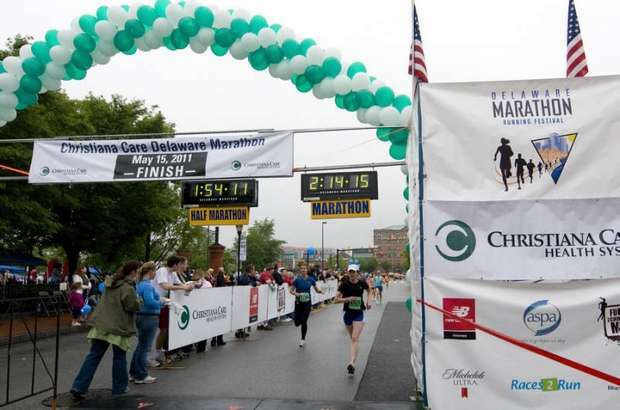 The Arlington, Va., resident broke his own record -- again -- for the fastest marathon run on Delaware soil, clocking a 2:25:11 at the eighth annual Christiana Health System Delaware Marathon on Sunday. Darryl Brown, 28, set a fast pace early, gapping Wardian by 30 seconds in the early miles. He cruised through the midway point in around 1:12, a time that would have easily won the half-marathon race. But Wardian had plenty of gears left. He passed Brown and began to gap him around mile 18 near the Brandywine River. "I kind of ran my own race," Wardian said. 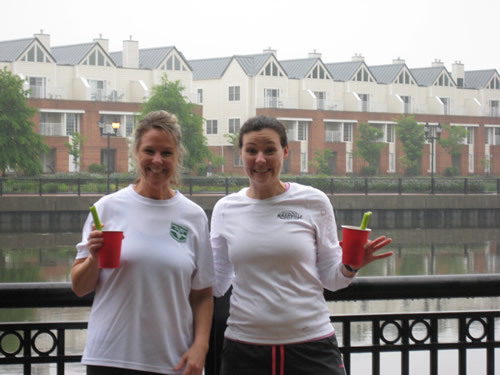 "It was humid, but it was actually good because I'm training for some hot weather races right now. I was happy with the conditions being a little bit challenging." Next up for Wardian is the grueling Comrades Marathon in Durban, South Africa . The 89-kilometer race is the world's oldest ultramarathon. Last year, Wardian crossed the line as the first American finisher. This was Brown's marathon debut. 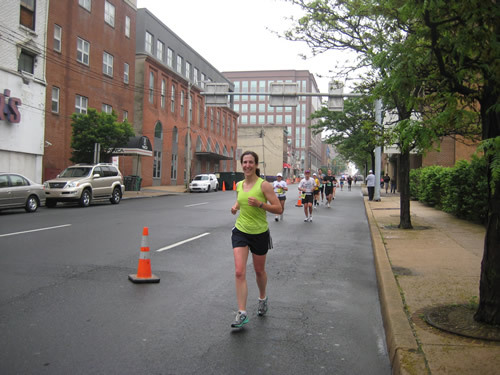 The Exton, Pa., resident won the Caesar Rodney Half Marathon in March in 1:09:46. He also coaches track and field at Tatnall. "I wanted to negative split the last six miles, but it didn't quite go as expected," said Brown, who finished second in 2:35:02. "Next time I might choose a less hilly course. It's a lot tougher than it looks." 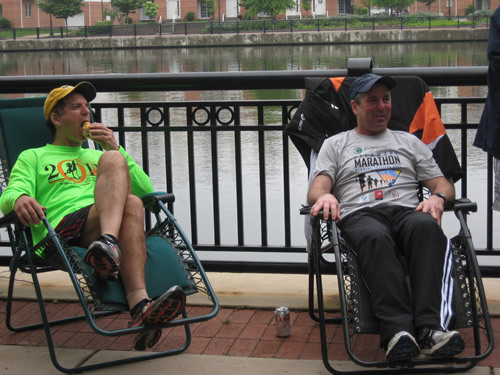 Brown has his sights set on qualifying to run the marathon at the 2012 Olympic Trials in Houston. He'll get a shot to run the standard of 2:19 at the Chicago Marathon in October. Jenny Malik captured the women's title in 3:16:52. The 32-year-old Rochester, N.Y., native started running just a few years ago. 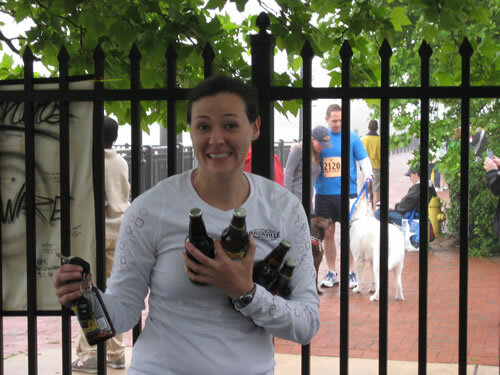 This was her 10th marathon. 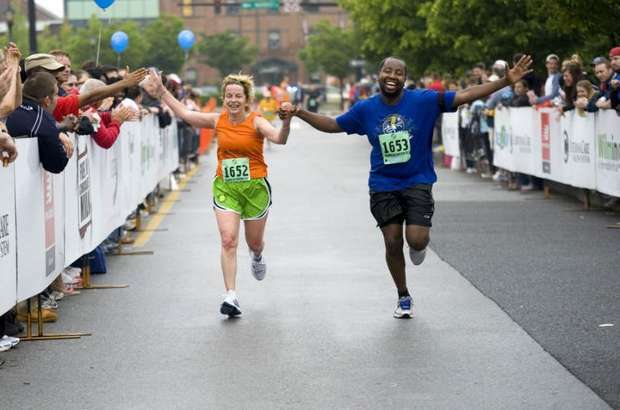 "This was my husband's first marathon," Malik said. "I did the training with him, and I figured I might as well run it, too." Malik, who trains with the Genesee Valley Harriers, was all smiles when her husband, Jeff, crossed the line in 3:47:25. "For the first part, I found a nice little group of five guys and jumped in with them," she said. 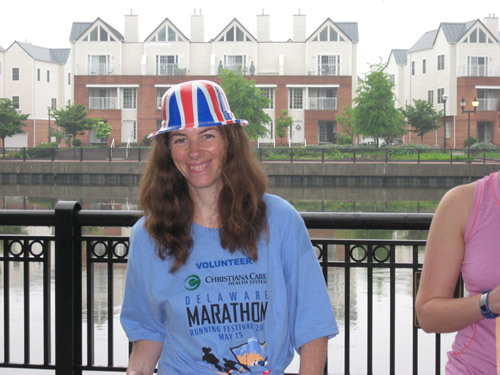 "I was alone the second half, but it was nice to have all the half-marathon people running so I had people around me." 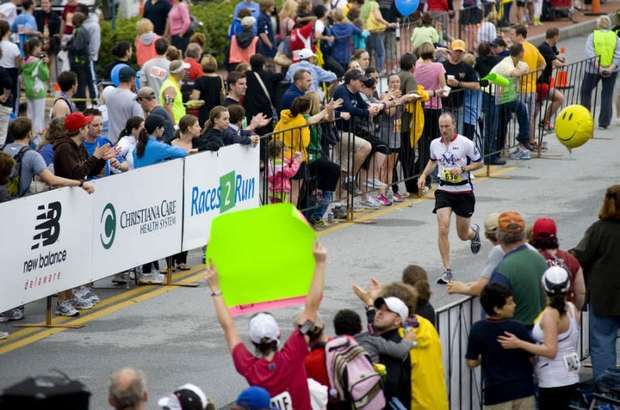 Richard Bounds, 32, won the half marathon in 1:20:30. 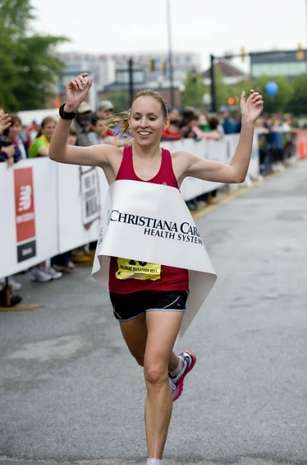 Amanda Luksetich, 29, was the first women's finisher in 1:28:47. More than 400 volunteers helped out on race day, which began with setup at 4:30 a.m. 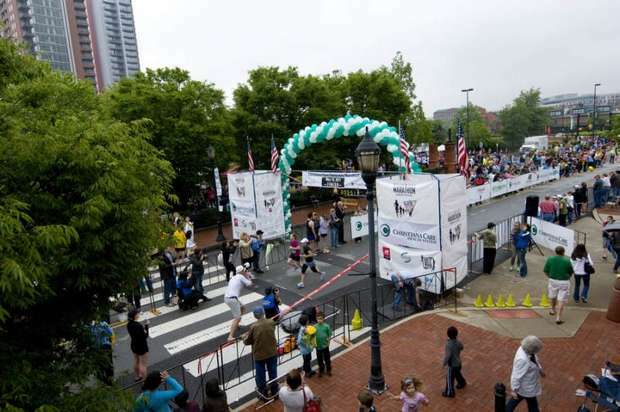 Proceeds from the races will go toward several local charities, including Girls on the Run and Christiana Care's Center for Heart and Vascular Health.